We're puttin' that ® brand on our merchandise! Our merchandise is currently being expanded and amended. our new ® to reflect this legal development. What's Black and White and "Read" All Over? your opponent won't be able to take his eyes off it. features an adjustable fabric strap. Order one today. Because, the man who has everything, doesn't have this. 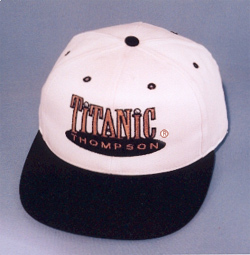 and beautifully embroidered TITANIC THOMPSON™ logo. It comes complete with a brass grommet and clip. And, it's the perfect gift! Because the man who has everything, doesn't have this. The U.S. Patent and Trademark Office has ruled that "Titanic Thompson"
is now a Federally Registered Trademark of Sunbelt Productions, Inc. 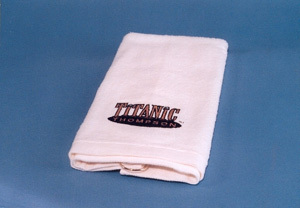 This website is the only place you can buy authentic Titanic Thompson® brand Merchandise. All materials on this website are copyrighted by Richard Campbell/Sunbelt Productions, Inc.
Reproduction by any means of any and all materials viewed here is expressly forbidden. Consultation on this site by TC Web Design.